Please note that the WHRS does not maintain a public shelter with regular hours. All of its rabbits are in foster care in private homes. To meet any of our rabbits, please make an appointment with our Chapter Manager in charge of rescue, foster and adoption. One goal of the House Rabbit Society is to buy a homeless bunny more time. Rabbits that would otherwise be euthanized at area shelters due to a lack of space, health or behavioral concerns are rescued and placed in an HRS foster home. Foster bunnies are spayed or neutered and any health concerns are addressed. Bunnies are litter-trained and any behavioral issues are corrected. 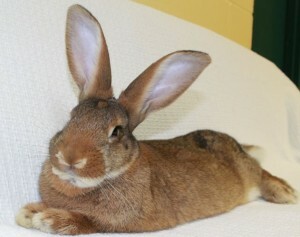 The desired outcome of a rabbit rescue is placement in a permanent, loving home. Every rabbit placed means another can be rescued. To view photos and read descriptions of bunnies currently available for adoption through the Wisconsin House Rabbit Society, follow this link. If you are interested in adopting a rabbit, but have never had a house rabbit before, we recommend that you read our Rabbit Care Guidelines. This document provides an overview of a house rabbit’s living requirements. This information will help you decide if a rabbit is the right companion animal for your household and lifestyle. If you have a rabbit and would like to find him or her a friend, we are glad to assist with this process. Please read The Dating Game for information on the bonding process.